Stroke is defined as the distance the piston travels from top dead center to bottom dead center. The stroke measurement is part of the calculation to work out the actual cubic capacity of your motor. Above is a picture of a pretty sad Vespa P200E crank to get some basics down. Small end - Usually a small caged needle bearing goes in this space to allow the piston to pivot. Older bikes just have brass bushings. Con rod - This connects the piston to the crank. Big end - There is a large bearing at the base of the con rod where it is connected to the crank. Crank pin - This passes through the big end and ties the two halves of the cranks together. Crank web - These are carefully weighted to be close to equal. 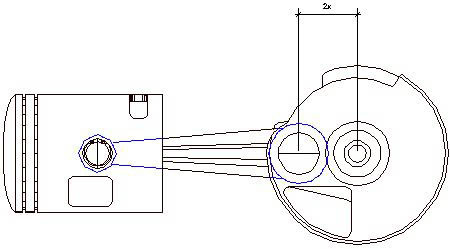 Above is a diagram of a P200 crank, con rod, and piston as viewed from the crank side. 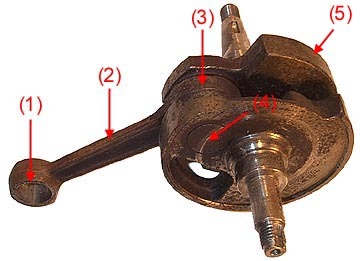 The stroke is measured as the distance from the center of the crank to the center of the crank pin, then it is multiplied by two to give the full travel. The diagram above is shown at top dead center (TDC) which shows the furthest extent of the piston travel towards the head. Bottom dead center (BDC) is shown below and is the furthest extent of the piston travel towards the crankcase. The crank pin is the piece of metal that holds the con rod to either side of the crank webs. It is usually as far back from the center of the crank as possible, so there is little ability to increase the stroke of an existing bike with typical methods. You can replace the crank pin with an off set pin to increase the stroke. This involves having a special pin fabricated with a smaller big end bearing and a different con rod. The area where the con rod rotates on the crank pin is a smaller diameter than the rest of the pin so the centers do not align. The center of the smaller pin can be offset towards the outside of the crank by a few millimeters and allow you up to about 3mm of stroke increase. The downside is the cost of the conversion and the fact that usually a smaller big end bearing means it will not be as durable.